Herein is described a robotic approach to high-throughput crystallization of membrane proteins in lipidic mesophases for use in structure determination using macromolecular X-ray crystallography. Three robots capable of handling the viscous and sticky protein-laden mesophase integral to the method are introduced. Li, D., Boland, C., Walsh, K., Caffrey, M. Use of a Robot for High-throughput Crystallization of Membrane Proteins in Lipidic Mesophases. J. Vis. Exp. (67), e4000, doi:10.3791/4000 (2012). Structure-function studies of membrane proteins greatly benefit from having available high-resolution 3-D structures of the type provided through macromolecular X-ray crystallography (MX). An essential ingredient of MX is a steady supply of ideally diffraction-quality crystals. The in meso or lipidic cubic phase (LCP) method for crystallizing membrane proteins is one of several methods available for crystallizing membrane proteins. It makes use of a bicontinuous mesophase in which to grow crystals. As a method, it has had some spectacular successes of late and has attracted much attention with many research groups now interested in using it. One of the challenges associated with the method is that the hosting mesophase is extremely viscous and sticky, reminiscent of a thick toothpaste. Thus, dispensing it manually in a reproducible manner in small volumes into crystallization wells requires skill, patience and a steady hand. A protocol for doing just that was developed in the Membrane Structural & Functional Biology (MS&FB) Group1-3. JoVE video articles describing the method are available1,4. The manual approach for setting up in meso trials has distinct advantages with specialty applications, such as crystal optimization and derivatization. It does however suffer from being a low throughput method. Here, we demonstrate a protocol for performing in meso crystallization trials robotically. A robot offers the advantages of speed, accuracy, precision, miniaturization and being able to work continuously for extended periods under what could be regarded as hostile conditions such as in the dark, in a reducing atmosphere or at low or high temperatures. An in meso robot, when used properly, can greatly improve the productivity of membrane protein structure and function research by facilitating crystallization which is one of the slow steps in the overall structure determination pipeline. In this video article, we demonstrate the use of three commercially available robots that can dispense the viscous and sticky mesophase integral to in meso crystallogenesis. The first robot was developed in the MS&FB Group5,6. The other two have recently become available and are included here for completeness. An overview of the protocol covered in this article is presented in Figure 1. All manipulations were performed at room temperature (~20 °C) under ambient conditions. Setting up to do a crystallization trial robotically begins with the preparation of the base-plate of the glass sandwich crystallization plate (Figure 2), described in detail in Reference 2. The base-plate must first be silanized and the perforated double-stick spacer that creates the wells, must be applied to the plate. The materials and supplies needed for this are itemized under Materials. Place the plate on a paper towel, apply a few drops of silanizing solution and distribute it evenly over the plate surface with a paper tissue. Remove excess silanizing solution by immersing the plate in a beaker of water. Take the plate out of the beaker, place it on a dry paper towel, silanized side up, and dry its exposed surface by wiping lightly with a paper towel. Peel off the protective cover on the perforated, double-stick spacer and apply the spacer, sticky side down, to the dry, silanized surface of the glass plate. Be sure that the spacer is positioned properly on the base-plate, with the upper left hand corner and the two adjacent sides of the spacer and the plate, coincident. Use a roller or brayer to flatten out the spacer on the base-plate and to create a tight seal between them. Pre-assembled plates are commercially available (HR3-151, Hampton Research; MD11-55-100, Molecular Dimensions; and LCP96T-UVP70U, Swissci). For cost reasons, we prefer to assemble our own plates following the protocol above. The first in meso robot to be demonstrated in this video article is the one currently in use in the MS&FB Group (Figure 3). Full details of the robot can be found under Materials and in the Reference section5. The materials and equipment required to set up a crystallization trial using the robot are itemized under Materials. Place the base-plate with spacer prepared in Section 1 on the deck of the robot. It has its own platform marked with well positions for purposes of base-plate alignment. The plate should be labeled for identification purposes. Secure the 96-well precipitant block in its own platform on the deck of the robot next to the crystallization plate. Open the block carefully by peeling off the plastic sealing cap. Turn on the humidifier and direct the stream of humid air over and across the base-plate on the deck of the robot. The humidifier has been shown to reduce evaporation of the precipitant solution and to enhance the reproducibility across the crystallization plate5. It can be turned on prior to set-up to pre-humidify the area when ambient relative humidity is low, or otherwise, just before the dispensing of mesophase commences. Initialize the robot following the manufacturer's instructions. Instrument specific instructions will not be described here in any detail because exact procedures will change over time. Essentially, what happens during initializing is that the mesophase dispensing arm on the robot is provided with reference positions in three orthogonal directions X, Y and Z. Attach the protein-laden mesophase in a Hamilton syringe, complete with dispensing needle, to Arm 1 of the robot (Figure 3). Full details of how to prepare the mesophase and how to load it into the syringe have been described in References 3,7-10. Remove the upper protective cover from the spacer on the crystallization base-plate and align the wells on the plate with fiducials on the base-plate platform. Note, for the purpose of this video, the protective cover was left in place to aid the Viewer during the alignment step. Align the needle tip of the dispensing syringe with the bottom of the uppermost well in the left hand corner of the crystallization plate (Well A1). This is done by eye adjusting the height or Z-coordinate of the dispensing arm while watching how close the needle tip comes to the bottom of the well. That the tip is just touching the bottom of the well can be judged by moving the plate from side to side on the platform whilst ever so slightly adjusting the height of the dispensing arm. Enter into the computer the Z-coordinate of the dispensing arm where the tip contacts the plate. Dispensing is programmed to take place with the needle tip 80 micrometers from this reference Z-position which corresponds to the surface of the base-plate. Position by eye the tip of the needle at the center of Well A1. Store in the controlling computer the reference X, Y coordinate of the dispensing arm where the tip is centered. This coordinate is used to define the center of the remaining wells on the plate. Prime the syringe using the appropriate command on the robot computer to ensure that fresh mesophase fills the dispensing needle and that the first and subsequent wells receive their full complement of mesophase. Wipe off extruded mesophase on the needle tip with a tissue. Start the Run Robot (X-AP) program to initiate a round of flushing steps where the precipitant dispensing tips on Arm 2 of the robot are washed and are prepared to aspirate solutions from the precipitant block. Activate the dispense function on the robot to set in motion the sequential loading of wells with protein-laden mesophase (usually 50 nl) first, a column of eight wells at a time, followed by precipitant solutions (usually 800 nl). 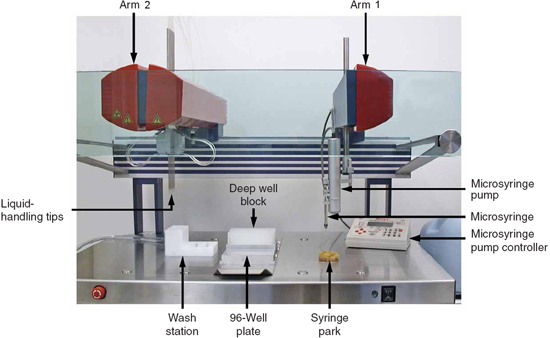 Between loading columns, the mesophase dispensing arm returns to a parking position where the end of the needle is placed in a moistened sponge to prevent the mesophase at the tip from drying out. The process of dispensing mesophase and precipitant is repeated 11 times across the plate until the plate is filled. 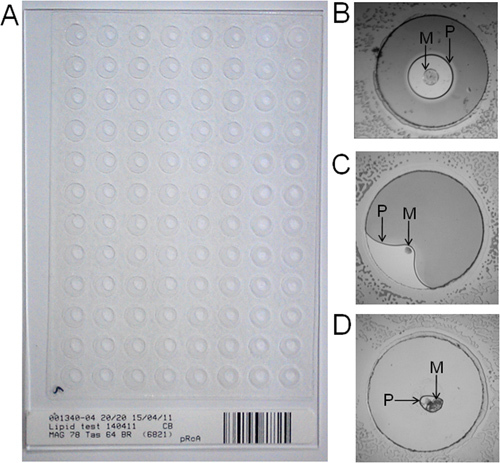 The loading of a 96-well plate with mesophase and precipitant takes 5 min to complete. As soon as the plate is filled and the robot arms have returned to their park positions, remove the plate from the deck of the robot and place it on a flat solid surface. Immediately, seal the plate with a cover-glass to minimize time-dependent changes in well composition. It is important to ensure that all 96 wells are fully covered, that the cover-glass is aligned square with the base-plate and that none of the cover-glass extends beyond the footprint of the base-plate. A roller or brayer is used to create a tight and a uniform seal between the cover-glass and the spacer. Inspect the plate to be sure the set up went as it should. What one is looking for is a 'fried egg on a pan' appearance in each well. The yolk of the fried egg corresponds to the mesophase. The white of the egg is the precipitant solution and the edge of the pan is the perimeter of the crystallization well. Ideally, the three are concentric. Place the plate in a temperature-controlled storage area for crystal growth. If no more plates are to be set up, remove the precipitant block from the deck of the robot, seal it tightly and put it back into storage. Remove the syringe containing the mesophase from the dispensing arm of the robot, dismantle it, and wash its parts including dispensing needle and ferrule, carefully with methanol and dry in preparation for next use. The Mosquito LCP robot (Figure 4) incorporates a similar mesophase dispenser to that used by Robot 1. In contrast to Robot 1, it dispenses precipitant by means of disposable tips. Programming software is used to set up the instrument for working with particular crystallization plates and precipitant blocks, and to dispense user-defined volumes of mesophase and precipitant in a specified sequence. Such details are provided by the manufacturer and will not be described here. Prepare a Hamilton syringe, complete with needle and filled with protein-laden mesophase, as described above under Robot 1 and in JoVE article 17121. Clamp the syringe in position on the dispensing arm of the robot. Use the deck mounted laser sensor to establish the X and Y coordinates of the needle on the dispensing syringe. This is an important step required to ensure that the mesophase is dispensed accurately at the center of each well on the plate. With the touch of a button on the control panel, prime the syringe to expel mesophase from the needle. Remove extruded mesophase from the needle tip with a tissue in preparation for using the robot to load wells. Before placing the crystallization plate on the deck of the robot moisten the surface of the platform with a few drops of water to help hold the plate in place by capillarity. Remove the protective cover from the spacer on the glass base-plate and place it on its platform firmly to ensure good adherence. Use the three fiducials on the platform to align the 3 corner wells thereby ensuring proper positioning of the wells on the plate with respect to the dispensing needle tip. The instrument is now commanded to enter a dispensing cycle. The cycle begins with a second priming step where mesophase is dispensed onto a small glass plate immediately before moving on to load wells with fresh mesophase. The robot first loads with mesophase a vertical column of 8 wells on the plate and then uses the disposable tips to dispense precipitant solution on top of the mesophase bolus. The process is repeated 11 times along the length of the plate until all wells are filled. The entire process takes about 5 min to complete. Remove the filled plate from the platform of the robot and seal it with a cover-glass as described above under Robot 1. Place the plate, properly labeled, in a temperature controlled environment for crystal growth. 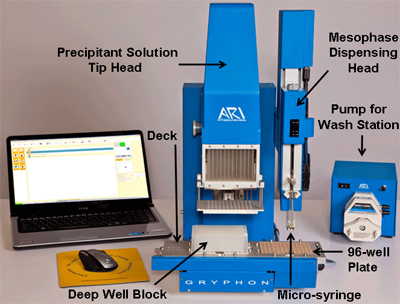 The Gryphon LCP robot (Figure 5) incorporates a similar mesophase dispensing system to that described above for Robots 1 and 2. What distinguishes it from the other two is that all 96 precipitant solutions are dispensed simultaneously. Prepare the protein-laden mesophase and load it into the dispensing syringe, as described above, under Robots 1 and 2, and in JoVE article 17121. Place the precipitant solution block and crystallization plate on the deck of the robot. Load the 96-tip head with precipitant solutions. A user-defined delay time is provided to facilitate aspirating viscous precipitants. Command the instrument to enter a dispensing cycle. The cycle begins with the mesophase being dispensed sequentially into the 96 wells in a process that takes about 1 min to complete. The 96-tip head then dispenses all 96 precipitant solutions at once on top of the mesophase boluses in the crystallization wells. The entire plate loading process is finished in 2 min. 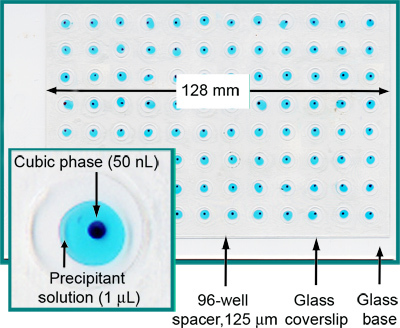 The purpose of this video article is to demonstrate how to set up automatically crystallization trials with a viscous, membrane protein-laden mesophase in glass sandwich 96-well crystallization plates. The emphasis is on automation through the use of specialized robots that require minimal manual intervention. Reproducibility and precision, in terms of volumes of mesophase and precipitant dispensed and the placement of both within the well, are expected when a robot is used. These are important from the point of view of effective screening of conditions that support crystallogenesis. They are also critical for the next step in the analysis pipeline which is to evaluate crystal growth often done with imaging equipment. Drop or bolus location is key to the imaging process, and irregular and improper placement of bolus in the well usually requires user intervention to correct for and takes time. For purposes of illustration, examples of properly and improperly loaded plates are shown in Figure 6. Figure 1. 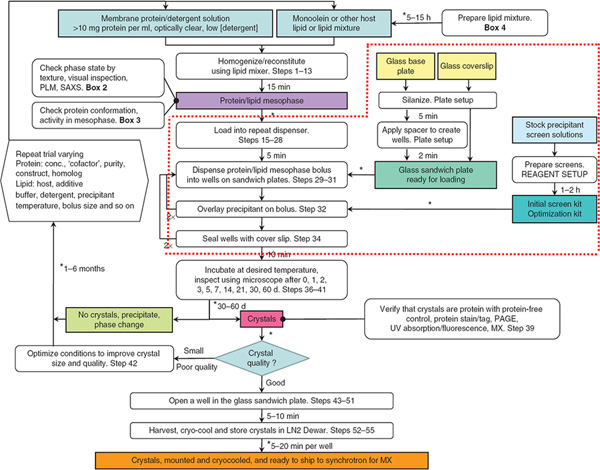 The flowchart summarizes the steps involved in the production, harvesting and cryo-cooling of in meso-grown membrane protein crystals. Steps surrounded by the dashed red line are the focus of this JoVE article. Robots were used to dispense mesophase and precipitant solutions in Steps 29-32. From Reference 3. Click here to view larger figure. Figure 2. A fully loaded and sealed 96-well glass sandwich crystallization plate. Each well contains 50 nl cubic phase and 1 μl precipitant solution. For clarity, the cubic phase has been stained with Sudan Red and the precipitant solution includes Methylene Blue. From Reference 5. Figure 3. The in meso robot (Robot 1). The robot has two arms. Arm 1 dispenses the protein-laden lipidic mesophase. Arm 2 dispenses precipitant solutions. During filling, the 96-well plate remains fixed in position on the deck of the robot which itself is stationary. The two arms move to deliver mesophase and precipitant solutions. From Reference 3. Figure 4. The Mosquito LCP robot (Robot 2). In contrast to Robot 1, the deck of the Mosquito LCP, upon which sit the 96-well plate and the precipitant solution block, moves horizontally during filling. Figure 5. The Gryphon LCP robot (Robot 3). During a set up, the lipidic cubic phase dispenser moves to deliver protein-laden mesophase onto the 96-well plate. The deck then translates horizontally to position the plate under the precipitant solution tip head. All 96 precipitant solutions are dispensed simultaneously. Picture sourced from the manufacturer (http://www.artrobbins.com/) and labeled. Figure 6. A fully loaded and sealed 96-well glass sandwich plate (A) and wells properly (B) and improperly (C, D) filled using the in meso robot (Robot 1). The bar code label on the plate in A is used to track the plate in the plate incubator/imaging device. In panels B-D, precipitant solution and mesophase are marked P and M, respectively. The expected 'fried egg on a pan' appearance of the well in B is characteristic of a properly loaded and sealed well. In C, the precipitant has been dispensed into the well improperly in an off-center position and has come in contact with the spacer. In C, it would appear too that the volume of mesophase is less than it should be. An example of incomplete loading with precipitant solution is shown in D. For scale, the diameter of all wells is 6 mm. 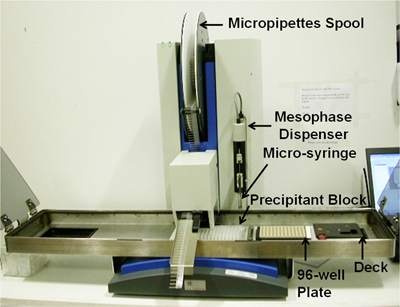 In this video article we have demonstrated how to use a robot to automatically set up in meso crystallization trials in 96-well glass sandwich plates using a protein-laden lipidic mesophase. The robots used in this work were specially designed to include a positive displacement glass syringe for accurate and reproducible delivery of nanoliter volumes of the viscous and sticky mesophase, as originally described7. Accuracy and precision are important features of a robot. However, these characteristics are only as good as the degree to and regularity which robot performance is evaluated and calibration is performed. It goes without saying that performance of the robot should be evaluated while individual plates are being set up. It is not appropriate to assume that the robot will function flawlessly and to leave the robot to run unattended. The attentive and observant operator should be in a position to note by a sound or an appearance when something is not working properly and to correct it immediately. Additionally, each plate should be carefully inspected by eye for uniformity of well contents as soon as the plate is sealed and before it is put away for crystallization trials. This should only require a few seconds to perform and can be done while the next plate is being loaded. Noticing, for example, that particular wells are not properly filled may highlight the fact that a certain precipitant dispensing tip is malfunctioning. Should delivery of mesophase be seen to be irregular, the relevant faulty item would need to be corrected immediately. By noting these issues and making the relevant adjustments during set up will save time and materials, including valuable lipid and membrane protein. If an imager is used to track crystal growth, accuracy and precision can also be monitored during imaging. For example, systematic problems with drop or bolus location by the imager indicate that something is not right and that corrective action somewhere upstream in the protocol is needed. In the interests of reliable performance therefore the robot must be calibrated on a regular schedule and as needed. Calibrations should include volume of precipitant and mesophase delivered as well as bolus and precipitant placement in the well. Obviously, wherever possible calibration should be done using volumes and materials similar to those that will be used in trials conducted in the period covered by the quality control exercise. As important as calibration is so too is having in stock an adequate supply of robot parts and supplies. Catastrophic and unexpected failures, blockages and crashes can and do occur. In such an event, having available a replacement precipitant delivery tip, for example, might mean that an extremely valuable membrane protein preparation is used as it should and is not wasted. Some of the advantages of a robot include the fact that it will work essentially continuously and that it does not suffer from or 'complain of' fatigue. A robot can also be used under conditions that are not considered human-friendly, such as in the dark, under controlled lighting and environmental conditions, and at extremes of temperature. The robots demonstrated in this article were all used under ambient conditions at ~20 °C. However, there are proteins and projects that require non-ambient temperatures, controlled light11,12 and an oxidizing or a reducing environment13. All of these can be catered for, with relative ease, when a crystallization robot is used. 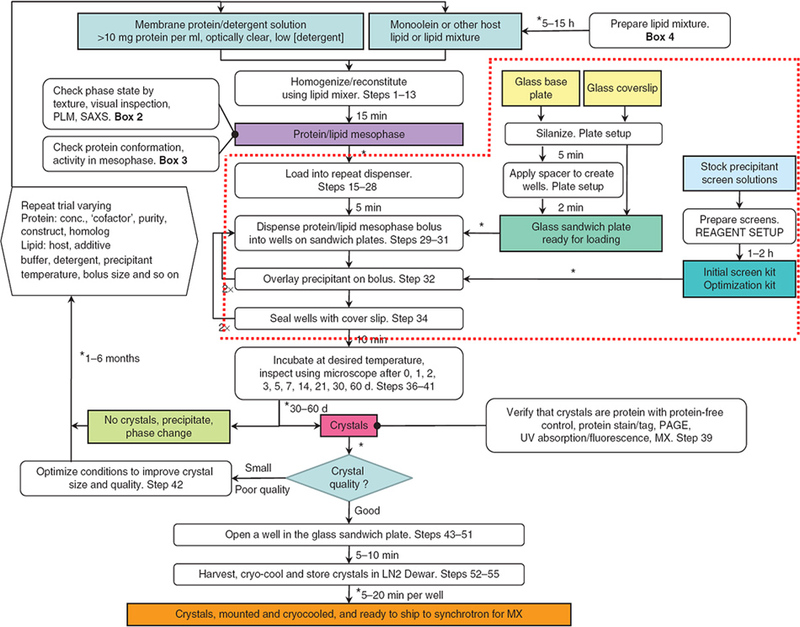 In an earlier JoVE video article we demonstrated how crystallization trials by the in meso method are set up manually 1. The minimum volume of mesophase that can be dispensed reliably by hand is limited by the visual acuity and steady handedness of the person setting up the trials. In our experience, volumes of mesophase as low as 100 nl are readily handled. We know of one lab where the default volume dispensed manually is about 40 nl. However, considerably smaller volumes are possible using a robot. Separately, we have shown that mesophase volumes as low as 550 picoliters can be dispensed robotically14. From that work it was clear that further miniaturization by robot is possible which, if implemented, would lead to a large reduction in the amount of valuable membrane protein needed to carry out a crystallization trial. In this video article, three commercially available robots were used to demonstrate high-throughput membrane protein crystallization using lipidic mesophases. The first of these was developed in the MS&FB Group based on our experience setting up trials manually, as described in JoVE 17121. This is the instrument we have most familiarity with and the bulk of the current article is devoted to its use. The other two robots were on demonstration in the MS&FB Group at the time the article was written and the relevant footage is included here in the interests of completeness. All three robots use very much the same mesophase dispensing system, the essential feature of which is a positive displacement glass syringe5,7. They differ most significantly with regard to precipitant delivery. Robots 1 and 2 can dispense precipitant simultaneously into 8 wells, a single column on a crystallization plate at a time. In contrast, Robot 3 dispenses all 96 precipitant solutions in a single action. Robot 2 is the only instrument with disposable precipitant dispensing tips. There are pros and cons associated with the different instruments that depend on the particular application; these will not be elaborated on here. Suffice it to say that all three work and have produced crystals of membrane proteins by the in meso method. The next steps in the overall process of structure determination by macromolecular crystallography are to harvest and to cryo-cool crystals from plates set up as described in this video article and to record and process X-ray diffraction from them. These topics are covered in separate JoVE articles in this series1,15. There are many who contributed to this work and most are from the Membrane Structural and Functional Biology Group, both past and present members. To all we extend our warmest thanks and appreciation. This work was supported in part by grants from Science Foundation Ireland (07/IN.1/B1836), the National Institutes of Health (GM75915, P50GM073210 and U54GM094599), and FP7 COST Action CM0902. Caffrey, M., Porter, C. Crystallizing membrane proteins for structure determination using lipidic mesophases. J. Vis. Exp. (45), e1712 (2010). Cherezov, V., Caffrey, M. Nano-volume plates with excellent optical properties for fast, inexpensive crystallization screening of membrane proteins. J. Appl. Crystallogr. 36, 1372-1377 (2003). Caffrey, M., Cherezov, V. Crystallizing membrane proteins using lipidic mesophases. Nat. Protocols. 4, 706-731 (2009). Liu, W., Cherezov, V. Crystallization of membrane proteins in lipidic mesophases. J. Vis. Exp. (49), e2501 (2011). Cherezov, V., Peddi, A., Muthusubramaniam, L., Zheng, Y. F., Caffrey, M. A robotic system for crystallizing membrane and soluble proteins in lipidic mesophases. Acta Crystallogr. D Bio.l Crystallogr. 60, 1795-1807 (2004). Peddi, A. High-throughput automated system for crystallizing membrane proteins in lipidic mesophases. IEEE Trans. Autom. Sci. Eng. 4, 129-140 (2007). Cheng, A., Hummel, B., Qiu, H., Caffrey, M. A simple mechanical mixer for small viscous lipid-containing samples. Chem. Phys. Lipids. 95, 11-21 (1998). Caffrey, M. Crystallizing membrane proteins for structure-function studies using lipidic mesophases. Biochem. Soc. Trans. 39, 725-732 (2011). Caffrey, M. Crystallizing membrane proteins for structure determination: use of lipidic mesophases. Annu. Rev. Biophys. 38, 29-51 (2009). Caffrey, M. Membrane protein crystallization. J. Struct. Biol. 142, 108-132 (2003). Gushchin, I., Reshetnyak, A., Borshchevskiy, V., Ishchenko, A., Round, E., Grudinin, S., Engelhard, M., Buldt, G., Gordeliy, V. Active State of Sensory Rhodopsin II: Structural Determinants for Signal Transfer and Proton Pumping. J. Mol. Biol. 412, 591-600 (2011). Jordan, P., Fromme, P., Witt, H. T., Klukas, O., Saenger, W., Krauss, N. Three-dimensional structure of cyanobacterial photosystem I at 2.5 angstrom resolution. Nature. 411, 909-917 (2001). Grawert, T., Span, I., Eisenreich, W., Rohdich, F., Eppinger, J., Bacher, A., Groll, M. Probing the reaction mechanism of IspH protein by x-ray structure analysis. Proc. Natl. Acad. Sci. USA. 107, 1077-1081 (2010). Cherezov, V., Caffrey, M. Picolitre-scale crystallization of membrane proteins. J. Appl. Crystallogr. 39, 604-606 (2006). Li, D., Boland, C., Aragao, D., Walsh, K., Caffrey, M. Harvesting and cryo-cooling crystals of membrane proteins grown in lipidic mesophases for structure determination by macromolecular crystallography. J. Vis. Exp. (67), e4001 (2012).